The original Suzuki Katana was an incredibly forward looking design and rode like a dream. It’s one of those bikes with a name that carried weight, which very few historically have. When Suzuki killed the name at the end of 2006, it was assumed that it would stay gone. Over a decade later, the name is back for the 2020 model year, and it brings an injection of nostalgia for the original. 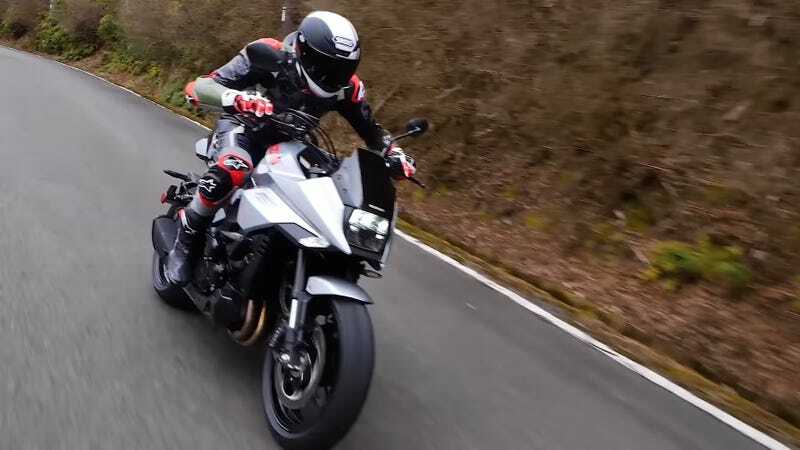 Motorcyclist Magazine’s Adam Waheed recently got the chance to ride the new bike in Japan and tell the world about it. When the GSX1100S Katana originally launched in 1981, it was immediately a wild departure from anything else on the motorcycle market with sharp angles and a forward leaned design. It was also one of the fastest things on the street at the time, with Suzuki claiming it was the fastest mass-production motorcycle in the world. Through the late 1980s, the Katana name was muted and neutered a bit, as it was applied to the GSX-F line of bikes, which are more sports tourers, while the GSX-R “Gixxer” line carried on the torch of the original, and the Hayabusa took speed to new heights. This new bike is a mix of the two, blending sport with touring more effectively than previous Katana iterations may have. The 2020 Katana is ultimately based on the current GSX-S1000F with the S-model’s twin-spar beam alloy frame, but features sportier inverted forks, a GSX-R swingarm, and Brembo brakes. It’s not the sporty quasi-race version it once was, but as a stylish take on something comfortable and fast, the new Katana wins. With styling that pays homage to the original, it might find some love among elder millennials and young Gen-X who remember the name as the absolute beast it was, but who need something comfortable these days because what’s the point in riding into battle against the man if your back hurts when you get there? The new bike weighs a portly 474 pounds—near identical to the GSX-S1000F—and is claimed to have 150 wild horses on board. It still probably moves pretty well. Keep your wheelies under control, old man. Or don’t, who am I to judge?